A colonel receives five seeds in the mail—and dies within weeks. A young bride disappears immediately after her wedding. An old hat and a Christmas goose are the only clues to a stolen jewel. A son is accused of his father's murder. These mysteries—and many more—are brought to the house on Baker Street where detective Sherlock Holmes resides. No case is too tricky for the world's most famous sleuth and his incredible powers of deduction. This gripping collection includes many of the famous cases—and great strokes of brilliance—that make the legendary detective one of fiction's most popular creations. 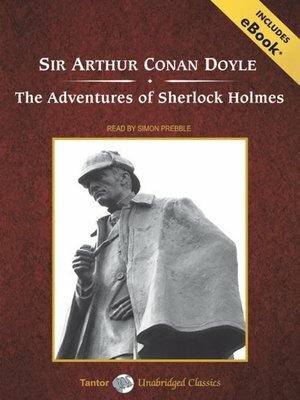 Included in The Adventures of Sherlock Holmes are "A Scandal in Bohemia," "The Red-Headed League," "A Case of Identity," "The Boscombe Valley Mystery," "The Five Orange Pips," "The Man with the Twisted Lip," "The Adventure of the Blue Carbuncle," "The Adventure of the Speckled Band," "The Adventure of the Engineer's Thumb," "The Adventure of the Noble Bachelor," "The Adventure of the Beryl Coronet," and "The Adventure of the Copper Beeches."